Presidente Pedro Pablo Kuczynski inspecciona labores de limpieza en río Huaycoloro. 10:08 | Chiclayo (Lambayeque region), Apr. 6. 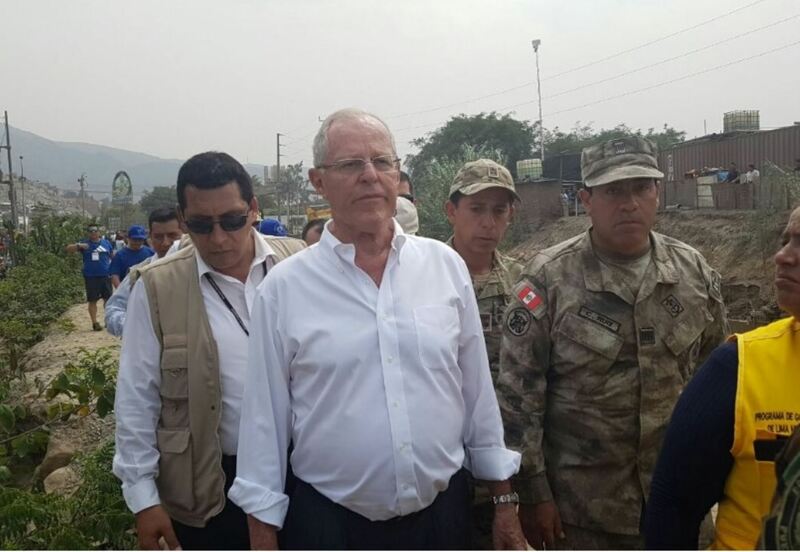 Peruvian President Pedro Pablo Kuczynski headed to Chiclayo city to inspect a field hospital run by the Ministry of Health (Minsa) aimed to assist people affected by rains and floods in the area. The Peruvian leader was scheduled to arrive at 9:00 AM at the Chiclayo's Air Group No 6 Base, joined by Ministers Martin Vizcarra (Transport and Communications), Patricia Garcia (Health) and Elsa Galarza (Environment). Later, he will visit Elias Aguirre Coliseum, where the aforementioned field hospital was established on February 12. While in there, he will monitor relief assistance provided to inhabitants affected by respiratory infections, gastrointestinal diseases, contusions, injuries, intoxication, as well as pediatric and geriatric conditions. The 24-hour health care center offers gynecology and neonatology services to conduct pregnancy check-ups, provide childbirth attendance and caring for new-born infants. Since its establishment, the hospital has assisted around 300 patients a day. Due to floods and landslides, the Government committed S/.2.5 million (about US$769,000) to address the health emergency, intensifying actions against dengue fever, leptospirosis and chronic respiratory diseases caused by pollution, dust, allergies, among others. Likewise, houses have been fumigated to prevent the spread of Aedes aegypti, the principal mosquito species that transmits Zika, dengue and chikungunya viruses, among other actions. In addition, initial support brigade officers were deployed in Lambayeque to reinforce assistance actions and provide aid to affected inhabitants. Lastly, the Head of State will fly over the area hit by La Leche River's overflow in order to monitor Executive's emergency response works.